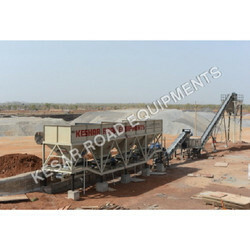 Kesar Soil stabilizing machinery as Wet Mix Macadam Plants is the Synonym for High quality Top notch performance, Lower operating costs, Superb Service back up translating into productivity and return in turn High profits for the customer. Conforming to international standards the WMM range of Wet Mix Plants also conforms fully to the latest MORTH (Ministry of Road Transport & Highway) specification. The Kesar Wet Mix Plants has a class engineered to last, Standard Make Bought outs, precision engineering, quality processes and procedures with Kesar's rich experience ensure the pride in owning. Cold Aggregates Bin Feeders – Over Size Removal Vibrating Screen - Slinger Conveyor – Pugmill Mixing Unit - Load Out Conveyor with anti Segregation gob hopper – Water Storage Tank – Fully Automatic Control Panel, Weather Proof Control Cabin. As 2007 more than 60 plants of capacity ranging from 100 to 250 TPH are in operation. 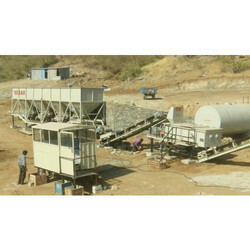 Mobile Wet Mix Plant offered comes designed and developed using latest technology support and provides for efficient working and consistent performance as desired and demanded by the customers. Featuring support of concrete mixer, PLD batching machine cement silo and control system, these plants allow production of different types of concrete including quaking concrete and hard concrete and others. Some of its features include used in large and medium scale building works; ideally suited for producing commercial concrete; compact structure finish; allow for quick installation; advantages of fast mixing support and others. 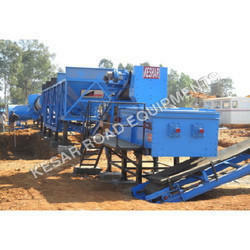 'KESAR' is a leading supplier of WET Mixing Macadam Plant and machinery, with the focus very firmly on road building. Ever since we established, we have been setting benchmarks in the road-building industry, thanks to countless innovations and solutions which are as competitive as they are dependable. True to our motto - “High Productivity, Performance & profitability” - we gear our activities totally to the needs and requirements of our clients across the globe. We are entering a new era of development, energy crisis & environmental concerns. Our customers & their challenges are the impetus to our product development accolades. Our customers must generate profits amid this turbulent times and varying needs. So, we focus on–'sustainable and profitable development is highly manifested'- in our futuristic generation Wet Mix Macadam plants. Our each model inherits a tradition of over two decades of experience in working with clientele & evolving markets nation-wide. The 'KESAR' WMM series offers customers the finest & proven technical solution, with international product support, latest generation process controls and automation together with total installation and site support, aimed to deliver precise mix - productively and profitably. The WMM series plants are fully equipped to deliver precisely mixed cold mix, cement/lime treated aggregate base course mixes, emulsion treated mixes etc. Quality & specific steel construction along with high quality bought out components ensure maximum reliability and uptime. Finest industrial design, built in to the product aims at uniform mixing, accurate proportioning and blending of aggregates and additives without segregation. into the product.Wet Material Mixing Plant for granular base and sub base production provides higher productivity with close control on quality of mix and production costs.